Home Biafra Featured THE BIAFRA REFERENDUM: THE ULTIMATE ROAD TO FREEDOM. 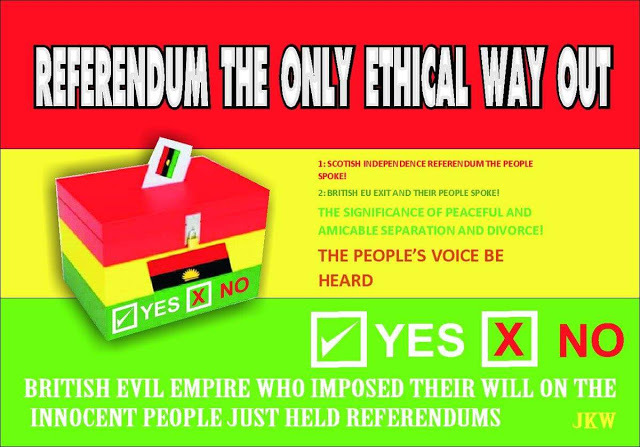 THE BIAFRA REFERENDUM: THE ULTIMATE ROAD TO FREEDOM. Broad is the way that leadeth to destruction and damnation. Unfortunately, many there be that find it and walk therein. But narrow is the way that leadeth to life and bliss. And, unfortunately too, few there be that find and walk therein. The above admonition by our Lord Jesus reflects the misfortune that has become the lot of many a Biafran of the present generation. Because of the many years of accumulated deceit and brainwash, many people have come to live with the mischievous misinformation that any talk or dream of reviving and restoring Biafra is a hollow talk or a pipe dream. This contributes to their being indifferent, or averse, or outrightly sceptical or antagonistic to the cause of Biafra restoration. Simply put, such people see the issue of Biafra restoration as an impossibility (But I'm sure everybody knows in whose dictionary to find "impossibility"). Of course, the recent events, especially the milestones recorded by IPOB ably led by Mazi Nnamdi KANU, have PROVED to such sceptics that Biafra is much nearer than can ever be imagined. They could be possibly asking in their minds "what shall we do? Is it not better we join hands and select Biafra conscious politicians, make them our representatives, and use them to bring Biafra to materialization?" Just as many One ‘Nigerianists’ have chosen to be ignorant of the fact that the British inhumanity called Nigeria is irredeemable, so have these Biafrans chosen to live in the hallucinatory delusion that they can recover Nigeria, and on the platform of Nigeria, pursue their wellbeing. These are the people that can be found on that Broadway that leads to destruction and damnation, and as was predicted/prophesied, they are innumerable. But there are yet a handful, a few remnants, an insignificant number, an infinitesimal percentage of Biafrans, who KNOW that our Supreme Leader, Mazi Nnamdi KANU, was specifically sent by God for the mission of restoring our dear nation, Biafra. For that, we are following prescriptively ALL his direction about process of restoring Biafra (Ife ọbụna a sị ụnụ mee, meenu ya). Whatever you are told to do, do it. We are, therefore, the few that were prophesied about, who would find the narrow strait way that leadeth to life and bliss (freedom). And the world knows that so far, there has not been any single thing that we were told to do that we did, which did not catapult the Biafra restoration project to unimaginable heights. Having seen and known all these, what is, or should be the next line of action? The next line of action for EVERY BIAFRAN is to decide for, and work towards making the Biafra referendum that is around the corner a resounding success. No matter however the gangsters at Aso Rock may be trying to intimidate you, no matter however the Lagos Ibadan expressway brown envelope gutter may be distorting the facts, no matter how much the ‘liar-ological’ BBC may be disseminating its lies and distorting the news, no matter how intensified the murderous British genocide, through their proxy, the terroristic and parasitic Nigeria government may be, all in a bid to cower, distract, discourage and divert you from assiduously contending for your lifeline which Biafra represents and symbolizes, it is up to you to remain vehement, unrelenting, and unrepentant in your pursuit of making the Biafra referendum a grand success. You can also take your contribution a notch higher by investing in, and participating in the sensitization and publicity related activities for the referendum. This includes, but not limited to stringently educating ALL your FAMILY MEMBERS, (both immediate and extended), and constantly reminding them about the Biafra referendum, (its meaning, its process, and their obligations). You must equally support them by installing the satellite Biafra TV and Radio in a kind of Viewing Centre setting so as to ensure that no one is bereft of necessary information. Seeing all the above as glaring, incontrovertible, indisputable, and irreducible fact of the imminent implosion of Nigeria, together with all its victims, who call themselves citizens, one must decide to pursue the black goat by the daytime. That hay that you must make while the sun shines is to decide wholeheartedly for the Biafra referendum because it is the only road to legitimate and enduring freedom for all Biafrans.